Welcome to Tea Tuesday, a dedicated day of the week where I stop and take time for tea, a wonderful English tradition. Spring has officially arrived, and I have a new family of robins setting up house in the bird’s nest outside my office window. Spring is a time of birth, renewal and Easter. This week Christians around the world are celebrating Easter. A moveable feast, Easter occurs the First Sunday after the Full Moon following the Vernal Equinox in the Northern Hemisphere. Just check a calendar, it’s much easier. Marking the end of Lent, Holy Week leads to Good Friday which commemorates the crucifixion and death of Jesus Christ who died for our sins on the cross. On Easter Sunday we celebrate his resurrection. Easter is also linked to the Jewish Passover by symbolism and where it falls on the calendar. Easter customs vary across the Christian world, but decorating Easter eggs is a common motif. In the Western world, Easter takes on secular customs, such as egg hunts and the Easter bunny. The English tradition of wearing new clothes at Easter would have been gleefully followed by the women of Downton Abbey, although I am not so sure about the Dowager. The Easter Bonnet, made famous by Judy Garland in Irving Berlin’s Easter Parade is the last of this tradition, which was to keep in harmony with the renewal of the year and the promise of spiritual renewal and redemption. Tea Tuesday was inspired by Christine, a follower who lives in France, who was curious about English tea traditions. Whether you take tea for pleasure, or for business as a rising business star entertaining clients, a little knowledge goes a long way. April Fools: On Sunday the Telegraph reported that X Factor’s Simon Cowell would be making a cameo appearance on Downton. Strange, particularly since his only acting credit is a voice over on The Simpsons. Fortunately this turned out to be an April Fool’s prank. The Dowager would not have been amused. Videos: Downton Paper Pals: So it has come to this in the Downton Off Season, watching paper doll pantomimes on YouTube. Actually this one is in pretty good taste. Follow the link to the 3 part series on my YouTube playlist. Videos: Dollhouse Downton. If dollhouses are more your cup of tea, this is a delightful production brought by Grace and Tanvi, who apparently still like to play with their little stuffed animals. A link to my Dollhouse Downton playlist on YouTube. Great fun. Just in time for Easter, lots of bunnies; I love Daisy and Mrs. Patmore as hedge hogs. Books: The Countess of Carnarvon is on a book tour to promote her wonderful book, Lady Almina and the Real Downton Abbey, outlining the true story of the Lady behind Highclere Castle, where Downton Abbey is filmed. Once I finish the book, I hope to provide an intelligent review. Again, another project for the Downton Down Time. 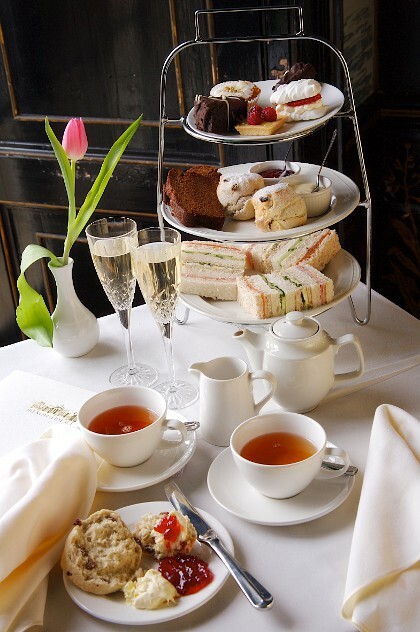 Lady Ellen’s Excellent English Adventure: Speaking of Lady Carnarvon’s speaking tour, stay tuned for the tale of the American who attended one of her Ladyship’s luncheons at the luxury UK hotel Tylney Hall, just down the road from Highclere. Not only did Ellen travel from Boston to the UK to attend the lunch, but was personally introduced to her Ladyship by the hotel organizers, and treated like royalty while she was there. Making a stir as the “American” who attended the luncheon, Lady Ellen will be providing us with summary of her whirlwind trip, and Tylney Hall also promises to provide us with a lovely recipe from their kitchens. Currant buns have graced tea trays for hundreds of years. Reverend Samuel Wigley founded the Currant Bun Company in Southampton, Hampshire UK in the 17th century. He discovered currants while on mission to the Greek Island of Zakynthos, and brought them back with him to create the currant bun. The versatile currant spawned a number of favorites. The currant bun is closely related to the Chelsea bun. In 1824 Duncan Higgins adapted Wigley’s recipe to create the classic Chelsea bun at his bakery close to the fashionable Chelsea district in London. It is rolled up like a cinnamon bun. The currant bun is also closely related to the Hot Cross bun which predates the Chelsea bun (1733). Your currant bun recipe can easily be transformed into hot cross buns by adding cinnamon, cloves and nutmeg, raisins, and candied peel. You then drizzle a cross with icing sugar mixed with a little milk. Hot cross buns are traditionally served hot or toasted on Good Friday, the cross standing as a symbol of the Crucifixion. In a small bowl or measuring cup, combine warm water and 1 tbsp. of the sugar, sprinkle yeast over top. Let stand for 10 minutes or until frothy. Meanwhile, in a large bowl, blend together remaining sugar, flour and salt. In a small bowl, whisk together the milk, butter, and eggs. Stir in yeast mixture until combined. Make well in the dry ingredients; using a wooden spoon, stir in the yeast mixture until a soft dough forms. Turn out the dough onto a lightly floured board. Knead for 8 minutes or until the dough is smooth and elastic. If you are new to working with yeast doughs, aim for 10 -12 minutes to get the hang of it. Transfer dough to a large greased bowl, turning to coat. Cover with plastic wrap and let rest in a warm place for 1 hour or until the doubled in bulk. If you can stick 2 fingers in the dough and the indentation remains, you are ready to proceed. Punch down; turn out onto floured surface; knead in currants. Shape into a 12-inch long log. Cut dough into 12 equal pieces. Roll pieces of dough into smooth, seamless balls. Place buns on greased baking sheet leaving about 2 inches between each bun. Cover loosely and let rest for 30 minutes. Bake in 400 F oven for 15 minutes or until golden brown. Stir together icing sugar and water, brush over warm buns; let cool on rack. Wow, Pam, are those your buns in the photo? I am having my family over next weekend and will likely make these, they look wonderful. Easter is really Easter Bunny time for me; a little sad these days since I don’t have my own special bunny. But at least there are the chocolate ones! Have a good one. Yes, I too miss my bunny Bart, but you are right, chocolate does help! Yeast breads was one thing my grandmother taught my mom and I well, although the challenge with using her recipes was that they made dozens and dozens of buns which she needed to feed her large family, me not so much. You get flour and gluten all over yourself and your kitchen but it is quite therapeutic. Not quite like chocolate, a martini or a 5 km run, but therapeutic none the less. I am glad glad a friend told me about your blog, it is great fun! I very much enjoy the intersection of history and food. Thanks for your kind words. I was inspired by “The Downton Effect” or what to do while waiting for Season 3. Pamela, you have so inspired me! I am planning a Titanic party for 20 or so attendees! Our ship, however, will sail and sink a week late due to a prior commitment. I am using my Cricut die cut machine to help with the decorations and some fun accents, including moustaches on sticks, ship themed treat cones, and hand made invitations. I also purchased a six foot tall copy of the movie poster and plan to cut out the faces for a guest photo spot. While serving a basically modern menu, I plan to feature recipes from first, second, and steerage class, as well as a suprise or two. I am having such fun planning the party, complete with period-ish wardrobes for my huband, daughter, and I. You sound like you will have a houseful for your party. Even if you only served the roast beef you will be covered, the important thing is to celebrate the lives tragically lost. Love your cricut creations. My sister in law is an avid scrapbooker, but if I can’t eat it I tend to lose interest!! Good luck with the party. Photos of all the food is on my Pinterest Board http://tinyurl.com/dy6r6lx. warm, chilled, or room temperature? I would lean towards warm or room temperature. More importantly is preparation and assembly. You can prepare the ingredients the night before, but assemble just before you plan to serve. Enjoy!